Clutter is not my jam. And there is nothing I despise more than cluttered countertops. I recently shared with you how I am working on a kitchen command center to help get the paper clutter off of my counters. But there is another thing that causes clutter too. I don't like all of the things on my counter. By things, I mean the handy dandy appliances and cooking tools.I mean I use all of the things, but I don't want them there all of the time. I mean I use all of the things, but I don't want them there all of the time. Coffee maker. Toaster. Knives. Can opener. All of the things. I'd much prefer countertops with space. A decoration or two. And room for me to cook (and take pretty pictures of the food I cook) without having to move stuff out of the way. The cords. I think that may be what gets me. The cords. My can opener, it has a cord that winds back into itself. It's the most amazing thing in all of ever. And I wish all my countertop appliances had that too! But they don't. Who am I kidding even if they did I still wouldn't want them sprawled all across my counter. In my old house, we had a pantry that housed all of those things and kept them out of site. But as usual, I find a solution rather than choosing to suffer. Because in DIY there is always a solution right? So I have decided I need an application garage! 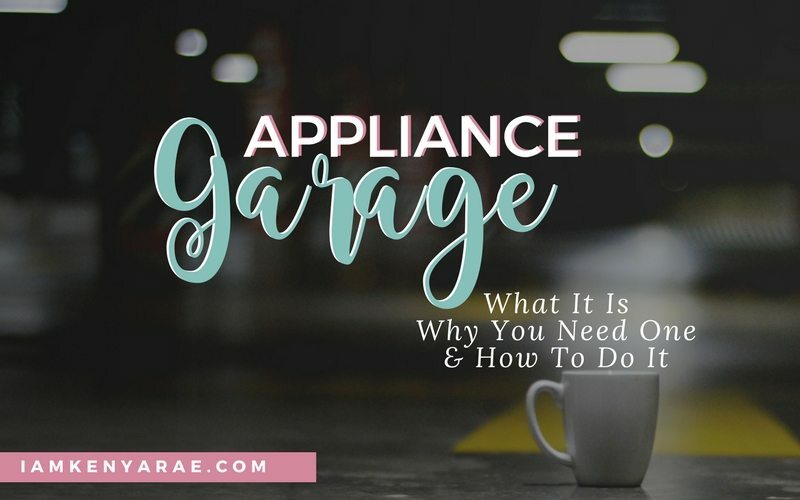 An appliance garage is a nifty little space where you can store countertop appliances and other things out of site and pull them out when needed. I've been perusing Pinterest as I am working through how this is gonna happen in Casa de Hampton. And I have compiled a nice little list for you. Cause you know, now you want one too! Not only is the garage nice, sleek and to the point. 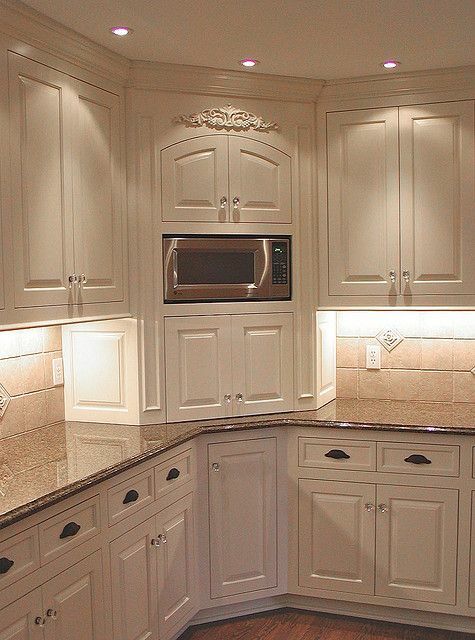 But how beautiful are the color of these cabinets?? While I like my microwave to be accessible. 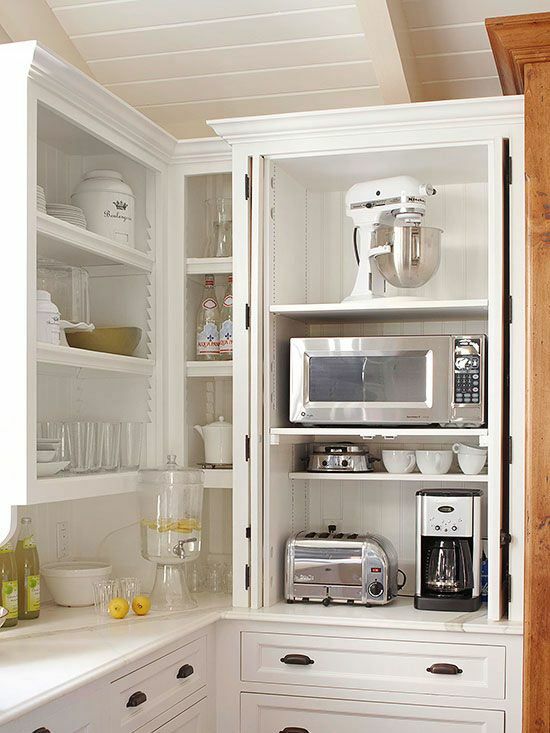 I love this for the person that prefers that their microwave is tucked away and out of sight! The door on this thing is pretty cool. While it would take a little more measuring and such to build this one, I think the finished result would be well worth it. This is so nice and classy to me. My cabinets were not properly installed (in my mind). So I don't have the corner cabinet like this cabinet install has. 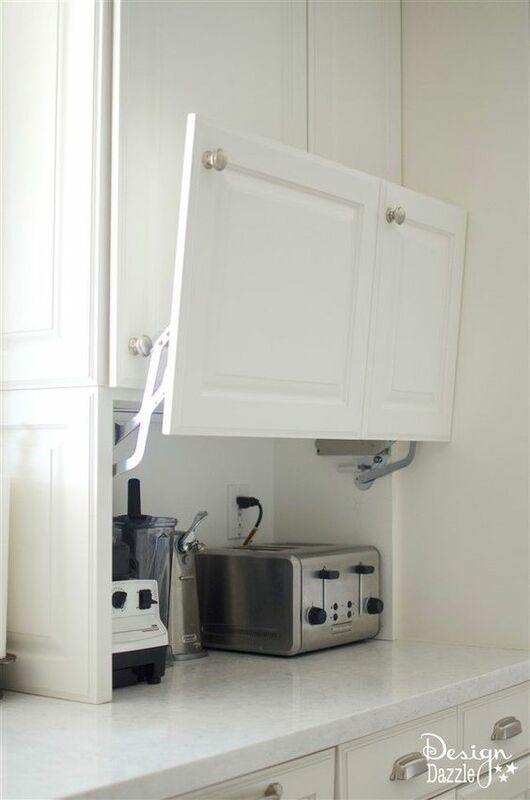 But if you do, this is a great way to take advantage of otherwise awkward counter space. 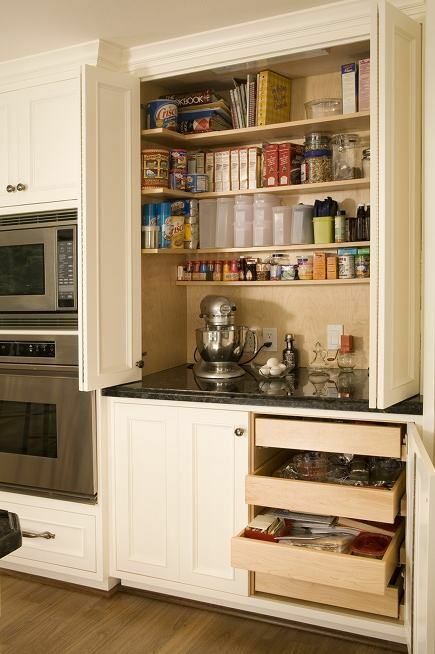 While for some people it seems to not be worth it to take up counter space with a cabinet that comes all the way down. 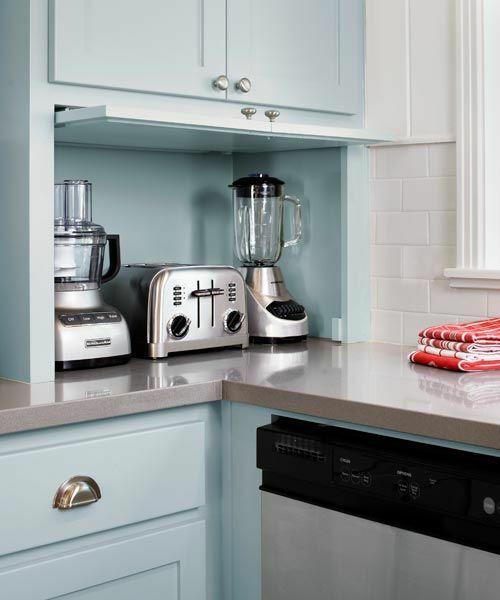 For those of us, who have no love for counter clutter, a kitchen appliance garage is a very simple and doable solution. You can buy cabinets and use them as an appliance garage. Here are some examples of things you can buy and use. How are you keeping your countertops decluttered? I really hate clutter as well. Its so easy to come home and dump the mail on the kitchen counter but I cringe at the thought of a kitchen that is not perfectly put away. I love your organizational ideas and pictures! these are goals. I love how you get things DONE!! I have so much clutter on our entryway table. I’m going to use some of your techniques there! I love this idea! I definitely want one in my kitchen. Just hate it when everything is all over the counters. 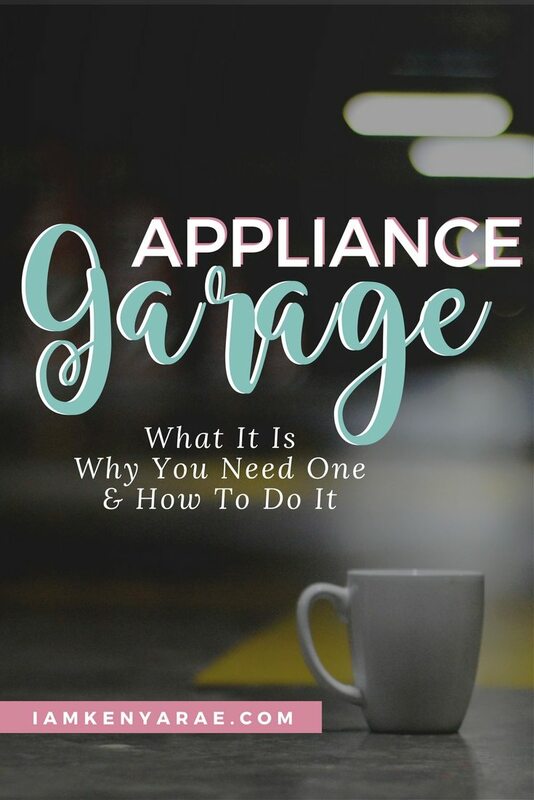 I hadn’t heard of an appliance garage before this but I definitely need one. If you saw all the appliances on my kitchen counter top you’d laugh! Definitely going to look into this, thanks! Definitely sounds like you need one! Mine are still in boxes from the move and I am trying to get my appliance garage together so they don’t get to my counter. I love a clean amd organized countertop! Cords are the devil! I agree. My can opener has a cord that winds into it at the push of a button. I would pay extra for all the other ones to have that same feature!